The ski area of Les Houches extends from an altitude of 950m to 1900m. From the summit one has a spectacular 360° view of the Mont-Blanc massive, and with 55 km of slopes meandering through the forests, you will discover the real pleasures of skiing. The international reputation of Les Houches is built on the World Cup downhill piste "la Verte", but the resort is also an ideal terrain for learners, particularly with the new beginners' area, at the top of Prarion. 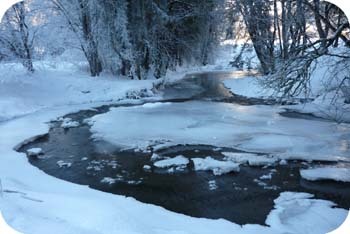 The forest trails are a delight for skiers and snowboarders of all levels. There is also a beginners area in the village for the little ones. When needed, artificial snow coverage is assured by more than 120 snow maker machines, positioned throughout the pistes of Les Houches. As well as down hill skiing and snowboarding, there are Nordic Ski paths where you can discover winter nature in all it's beauty, on cross-country pistes 'Ski de Fond' and snowshoe paths 'raquettes'. Les Houches offers 2 Nordic Ski trails: Les Chavants offers free access to cross country skiers combining snow fields and forests, and the trails of the Prarion require a lift pass as they are at high altitude. 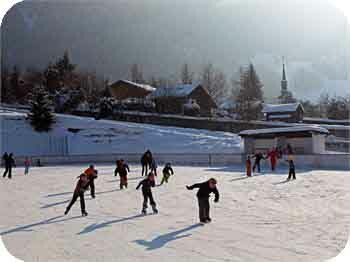 The ice rink of Les Houches is a natural and outdoor ice rink, situated in the heart of the village. Skate in front of the Mont Blanc massif or admire her pinkish tints at the end of the day. – During french holidays, open from Tuesday to Sunday from 2 to 5pm and from 8 to 11pm. 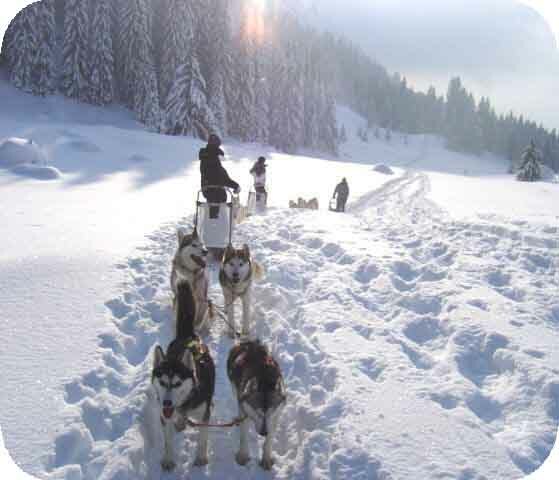 Professional mushers, Christophe and Elisabeth selected and raised their Huskies to offer you the best. 5 sledges are available, in the morning or afternoon. A trip consists of 15mn of briefing and 45mn of harness and driving. We can provide you with all the information you need for ski lessons and pre-book any lessons you might want, saving you valuable time from the ESF office on the first day of your holiday. A variety of ski-passes are available for the different areas within the Mont Blanc ski domain. Ask us for advice before you buy.